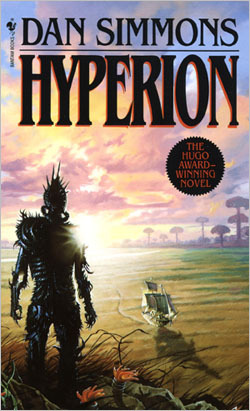 review Dan Simmons’ 1989 book Hyperion is a masterpiece of the science fiction genre and a must-read for any lover of classic sci-fi literature – especially if you like your humour black and your brain nicely splattered against the nearby wall as the author nicely shatters all your concepts about the things you think you know by the end of the book. The novel is the ultimate in quick and easy addiction – we couldn’t put it down and finished it in two days flat. The term “slow burning” in no way applies to this book. This is a fast-paced stunner of a space opera in six sumptuous parts that will knock your socks off. In Hyperion Simmons achieves what so few sci-fi writers even attempt – the creation of a vision that is complex, multi-faceted, and being worthy of described as literature rather than just fiction. There are three sequels to Hyperion — The Fall of Hyperion, Endymion and The Fall of Endymion. Littered with literary, religious and philosophical references and hilarious asides (a couple of items referring to cyberpunk author William Gibson are particularly hilarious), even the novel’s title is a reference – to the abandoned epic poem written by English poet John Keats shortly before he died in 1821. Structurally, the novel is a frame story, in which six ‘pilgrims’ tell the story of their lives on a lengthy voyage to the residence of a legendary creature known only as the Shrike. It’s the twenty ninth century after the death of Jesus Christ in Hyperion and humankind has colonised the stars, building a web of worlds spanning the galaxy and connected by gates which provide instantaneous travel to each. As a species, we’ve lived long enough to birth our own creations as powerful as gods – the all-knowing artificial intelligences which inhabit the domain known as the TechnoCore. Yet the only creature which humanity has discovered which could be described as an actual god is the Shrike, the legendary killing machine which lives in the so-called Time Tombs on the mysterious planet of Hyperion, to which travel is only possible via (slow) spaceship. On the eve of intergalactic war, seven pilgrims from all background make the traditional trip to visit the Shrike in its domain and plead for whatever boon they desire. As the pages of Hyperion turn, the reader will hear from most of these pilgrims one by one. And their lives have been as varied as the human civilisations of the twenty-ninth century are. A soldier. A priest. A scholar. A diplomat. A detective. And a foul-mouthed poet who is continually drinking. Their stories will each shock you to core and keep you riveted to the pages of Hyperion … even as they gradually reveal the layers of the complex world Simmons has created. Hyperion is one of those odd books in which you find it hard to really take in the prose or analyse it, because it’s written in such a comfortable style. Not, perhaps, unlike the writing of Joe Haldeman. The humour is constant and black, but you don’t really notice the author’s distinct voice, because he keeps you so close to the action by virtue of having each major segment told in first person by each pilgrim. At the end of each chapter there is a disjunctive pause as you are forced to leap back into the perspective of the entire group … knowing that you might have previously pre-judged one of its members, but now be forced to empathise with them. One of the remarkable things about the book is that Simmons plainly understands well the viewpoints of each of the characters. His writing style, the nuances of his appreciation of their individual characters, all illustrate just how wide his own personal knowledge and appreciation of human life is. How can one author see inside the coping mechanisms of a drunken poet, the cut and dried yet thriving appetite for life of a hardened soldier and the religious ecstasies of a priest at the end of his rope, simultaneously? It’s a task beyond all but the best of writers. One of the most impressive things about Simmons’ work is that he weaves in so many literary, philosophical and religious references … and yet they are not thrust in the reader’s face like in so much literature (think Ulysses), but used appropriately, to illustrate points of plot, character, or world. This is the ability of a master – to weave in so much of the milleiu of human thought, while still relating it to the thundering events of the moment and the minute changes that make up character development. I’m not the first to say it, and I won’t be the last. But before the Shrike comes for you in the dead of night and leaves the walls covered in your blood, do yourself a favour and read Hyperion. You might want to take a couple of days off work while you do so and consider not operating heavy machinery (say, nothing bigger than a toaster), because at no stage will your consciousness be remaining on Earth or in our century.